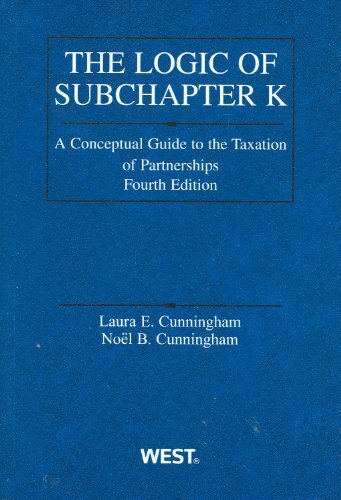 This product is designed to guide students through the conceptual framework of subchapter K. The material avoids neither the hard questions nor the conceptual difficulties, leaving students with a firm understanding of partnership taxation. Each chapter begins with a basic explanation of the relevant provisions and the roles that they play in the overall structure of subchapter K. It includes an increasingly detailed discussion of the specific rules, including multiple illustrative examples. Each chapter builds on the earlier chapters, leading the student through subchapter K. It is appropriate for J.D. or graduate-level law school courses on partnership taxation. Choice of Entity: What is a Partnership for Tax Purposes? A Preliminary Issue: What is a Liability? Section 751(b): The "Evil" and The "Cure"
Is the Anti-Abuse Regulation Valid or Necessary?